I had a very good dinner at Amura's the other night with a friend. We arrived right about "prime time" on a Saturday night and found a very busy place. However, we were seated immediately. One of the first things I noticed, besides the interesting interior decor, was the noise level. It was not loud, but there was the definite humm of a busy place, and they were indeed busy. No matter, our waiter appeared promptly and took our drink orders and gave us time to peruse the menu. Everything on the menu looked very good. They have a fairly diverse menu, many Asian dishes, but they also specialize in Sushi and Teppan style cooking. We chose two appetizers to start off with. 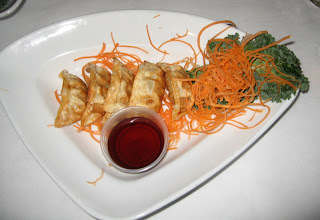 The first was the Gyoza -- Pan-fried dumplings with Ponzu sauce. They were excellent. The first thing we noticed was the presentation, and it was indeed impressive. But what about the taste? Spot-on. Lightly fried, they were stuffed with a delicious meat and vegetable filling. I was amazed by the ponzu sauce. I'd been expecting the normal overly salty soy-based sauce, but this was not so. It was a very delicate and tasty sauce, not overly salty, and a great compliment to the dumplings. I'd order this again in a second. Our second appetizer was Mushroom caps that were stuffed with a Krab stuffing, breaded and deep fried, then gently cut in half and served with a delicate creamy mayonnaise-based sauce. This was an excellent choice. At least they had the guts to call them "Krab stuffed" too. But the taste was absolutely wonderful and again, the presentation impressive. I'm not sure how they managed to skillfully cut them in half, they were quite delicate to eat. 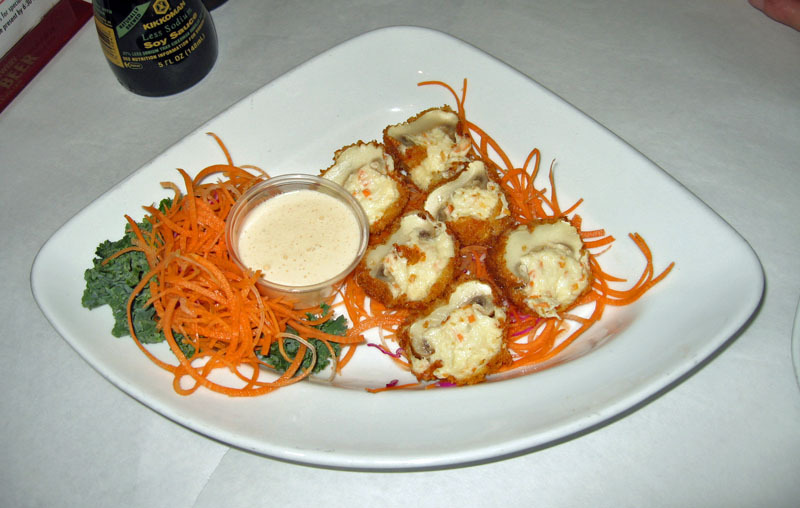 Nonetheless, this was a truly great appetizer, we both agreed. Our dinners came with a soup and salad. I chose the Miso soup, something I'd never had before. It was delicious and it did not take me long to finish it. The salad was quite small, not that I needed to eat a lot of food. 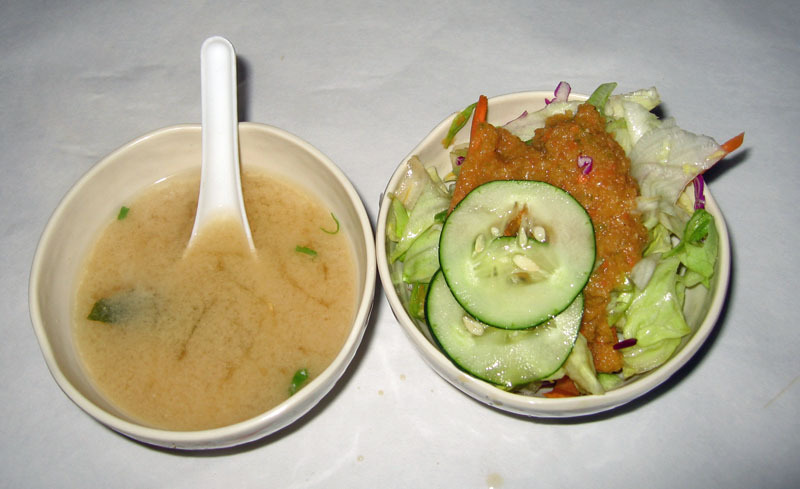 But the ginger dressing on it was nice, not overpowering as ginger dressing can sometimes be. I enjoyed both my soup and my salad. For his entree, my friend Tommy ordered the Trio Delight, a combination of shrimp, chicken, and beef that had been wok fried. Again, the first impression was good as the presentation was wonderful. 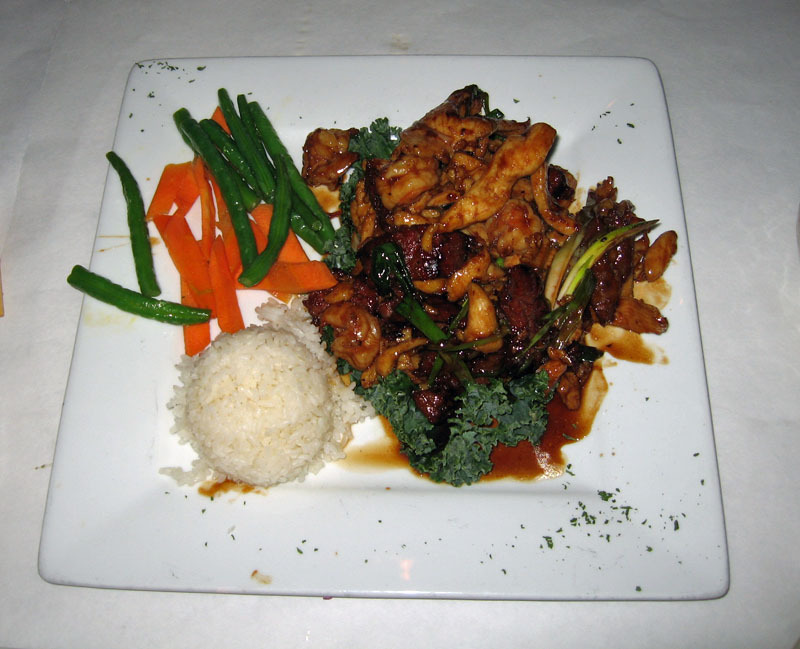 The trio was served on a kale leaf and accompanied by a ball of jasmine rice and mixed vegetables--slab-sliced carrots and green beans. The vegetables were perfectly cooked, just warmed and still crispy. And the trio--each element was tender and juicy, absolutely amazing. The sauce was delicate and did not overpower the meal. This was a fine meal. For my entree I went out on a limb and chose the TenderFiery Spicy Garlic Chicken. It was all it was advertised to be. For me, it was towards my upper limit of what I like for spice, and that's a good thing. It had a great heat to it. 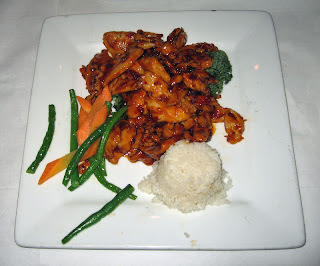 The sauce complimented the tender chicken white meat pieces that had been wok fried after being lightly breaded. Every element of the dish tasted great. I also had the beans and carrots along with the rice. I enjoyed this dish a lot--one of the best asian dishes I've had in a long time, and perhaps the best I've had yet in the Orlando area. I would eat this dish again in a heartbeat. Overall, we had a great experience here. Our check was about $58 and included one beer and an iced tea. One minor complaint though, the service, though prompt and efficient, was a bit less than attentive. I was served a pretty hot (spicy) dish, yet by the end of the meal my water glass sat empty and was never refilled. A minor point? Yes. And yes, they were quite busy. But when you pay good money for a meal you expect great service, mine was only good. I would never stiff a waiter, but in this case, though I'm usually a 20%+ tipper, I was not. This waiter only got a ten.. You need to work hard an be more attentive for that great tip! We had a great experience here and I'd love to go again. What I really would like is to go with someone who knows their sushi--Amura is known for it and I'd like to try it. Maybe next time. Any takers?